Family Promise in Anoka County (FPAC) is a non-profit interfaith hospitality network providing temporary shelter, hospitality and case management for families with dependent children experiencing homelessness. We recognize that poverty is a multifaceted problem that requires a multifaceted response. Our interfaith, nonsectarian network brings the faith community together to help our community's families regain housing, independence and dignity in a time of need. For more information about FPAC, contact us at info@familypromiseanoka.org. 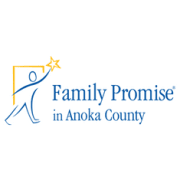 Would you recommend FAMILY PROMISE IN ANOKA COUNTY?